We've seen a number of unique mashups of augmented reality with other bleeding edge technologies, but somehow it took until 2018 for someone to come up with a now obvious complement to AR: 3D printing. Cornell information science doctoral student Huaishu Peng has developed an experimental technique that allows him to use AR to modify a 3D printing structure while it's being fabricated by a robotic arm. He calls the system the Robotic Modeling Assistant (RoMA). "Instead of designing 3D models on the computer screen, we wanted to give users the opportunity to work in conjunction with the robot. We call it in-situ fabrication," said Peng in an interview on Cornell's website. "The combination of AR and robot allows the designer to use the just-printed part to design their next features," said Peng. "The designer can even directly design and print on an existing physical object. This tightens the process between design and fabrication." To view the 3D printing model in real time in AR, Peng modified what appears to be an Oculus Rift and two Touch controllers by affixing a passthrough camera to the front of the headset. Although the 3D constructs are fairly rudimentary, the proof of concept is compelling in terms of what might be possible with such a dynamic in future. The demonstration video gives us peek at those possibilities by showing how RoMA can be used to fabricate purpose-built structures to support objects or sculpt objects with an AR-powered visual guide. The ability to design structures and objects around existing real objects using AR is completely unexplored territory, and Peng has likely only scratched the surface of what this AR meets 3D printing technique might be used for in coming years. 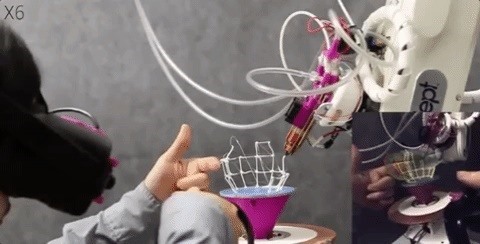 "In the future, we expect a robotic arm can be an intelligent design assistant," said Peng, who worked in collaboration with fellow Cornell students Jimmy Briggs, Cheng-Yao Wang, Francois Guimbretiere, as well as Patrick Baudisch of Hasso Plattner Institute in Germany, Joseph Kider of the University of Central Florida, and Stefanie Mueller of MIT. "There is a very promising future for the combination of augmented reality and 3D printing." Currently, there are no announced plans to commercialize the system, but the group of researchers will show off their work in April via a white paper at the Human Computer Interaction conference in Montreal, Canada.